A massive crane can make for quite the spectacle to begin with, but these Liebherr mobile cranes working in unison are simply too much! See the smallest crane in the line-up being lifted by the next-smallest, which is being lifted by yet another larger crane - until the gigantic LR 13000 crane is shown to be holding up all four of the cranes at the same time! It’s an incredibly impressive display of what these powerful machines are capable of handling. The cranes shown are from the Liebherr line of 2012, and the monster of the bunch is the LR 13000, the tallest and most powerful crawler crane in the world. It has a maximum load capacity of 3,000 tons, and a maximum hoist height of over 800 feet. 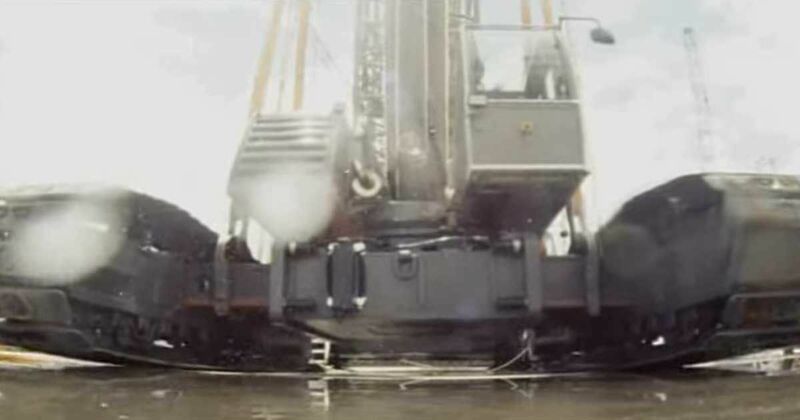 According to Liebherr, this model is also the only crawler crane of its type which can operate without a need for derrick ballast, thanks to the use of an in-house developed and manufactured slewing ring. The 643-foot reach of the massive Liebherr 13000 dwarfs the rest of their crane line-up. This look at Liebherr’s Customer Days of 2012 is most illuminating, and one can only imagine how impressive it must have been for the 2,000 lucky customers who were in attendance to watch. What happens when you put a locomotive supercharger on a first-generation Camaro? Over the past decade, China has been wowing the world with its fast building of new infrastructure though the use of innovative machinery. The Pottsville Historical Museum in Oregon runs this engine a few times a year. When it runs the ground shakes from the power. At first glance the 4955 trike might seem unwieldy, but as this video shows it can make short work of compacting crops.